I knew that the angels of God were there! Legion are the stories of those who were there and who suffered almost unto death and who carried all of their lives the scars of that dreadful experience. It was a tragedy without parallel in the western migration of our people. When all is said and done, no one can imagine, no one can appreciate or understand how desperate were their circumstances. “Some sharp criticism of the Church and its leaders was being indulged in for permitting any company of converts to venture across the Plains with no more supplies or protection than a handcart caravan afforded. “An old man in the corner sat silent and listened as long as he could stand it. Then he arose and said things that no person who heard him will ever forget. His face was white with emotion, yet he spoke calmly, deliberately, but with great earnestness and sincerity. “He said in substance, ‘I ask you to stop this criticism. You are discussing a matter you know nothing about. Cold historic facts mean nothing here, for they give no proper interpretation of the questions involved. [Was it a] mistake to send the handcart company out so late in the season? Yes. But I was in that company and my wife was in it and Sister Nellie Unthank, whom you have cited, was there too. We suffered beyond anything you can imagine, and many died of exposure and starvation, but did you ever hear a survivor of that company utter a word of criticism? Not one of that company ever apostatized or left the Church because every one of us came through with the absolute knowledge that God lives, for we became acquainted with him in our extremities. “‘I have pulled my handcart when I was so weak and weary from illness and lack of food that I could hardly put one foot ahead of the other. I have looked ahead and seen a patch of sand or a hill slope and I have said, I can go only that far and there I must give up, for I cannot pull the load through it. I have gone to that sand, and when I reached it, the cart began pushing me. I have looked back many times to see who was pushing my cart, but my eyes saw no one. I knew then that the angels of God were there. Although Francis Webster’s assertion that none of the company ever apostatized is not quite accurate, all available records suggest that it is remarkably close. 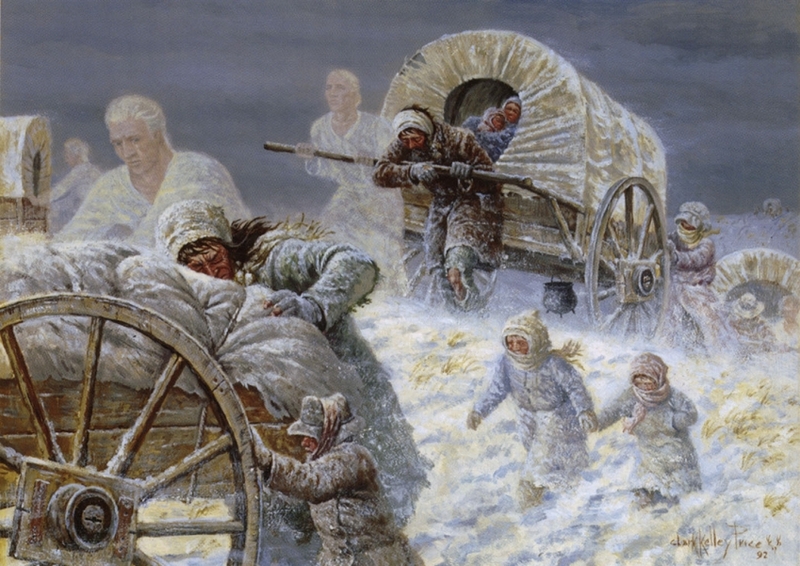 Like him, most of those who survived the handcart trek stand as a witness that when adversity is faced with faith, it strengthens spiritual commitment and draws a person nearer to God rather than weakening commitment and bringing alienation. Francis Webster died in 1906 at age 76. Betsy died the next year. Their influence continues to this day, not only on their posterity but on thousands who have been inspired by their example of faithful endurance. In Van Cott, Generations of Websters,61–62; see also David O. McKay, “Pioneer Women,” Relief Society Magazine, 1948, 8. “Faith in Every Footstep: The Epic Pioneer Journey,” Ensign, May 1997, 63; see also James E. Faust, “The Refiner’s Fire,” Ensign, May 1979, 53. This entry was posted in Angels, Church History, Endurance, Faith, Grace, Pioneer stories, Suffering. Bookmark the permalink.